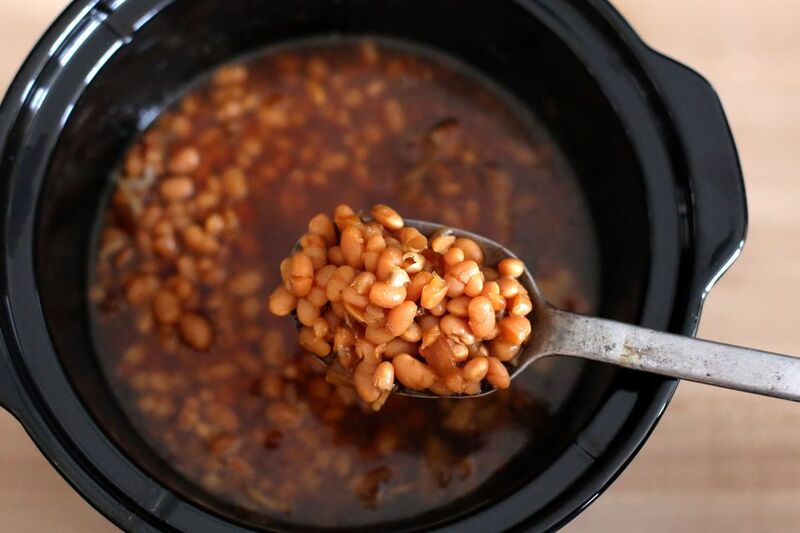 These homemade baked beans are made with dry navy beans or small white beans. The beans are soaked overnight and then slow cooked to perfection with molasses, salt pork or bacon, brown sugar, and onions. These are Boston-style baked beans. If you have trouble with beans getting tender in the crock pot, simmer them on the stovetop first until just tender, and then drain. This will cut the crock pot cooking time in half. Don't add salt or the Dijon mustard until the beans are tender. In the slow cooker, combine the soaked beans, water to cover, molasses, brown sugar, onion, and salt pork or bacon. Cover and cook on low for 6 to 8 hours, or until the beans are tender. Stir occasionally. Add the mustard and salt to taste when beans are tender. Continue cooking for 30 minutes to 1 hour. If the liquids are thin, turn the slow cooker to high and leave the cover ajar. In step two, use the soaking water or use fresh water. Some say that there is a reduced risk of gassiness if the soaking water is discarded, the beans rinsed, and fresh water is added. For a spicy tomato-based sauce with ketchup, reduce the molasses to 3 tablespoons and increase the brown sugar to 1/3 cup. If desired, add about 1/2 cup of diced green bell pepper along with the onions. When the beans are cooked and tender, add 1/4 cup of ketchup, 1 teaspoon of Worcestershire sauce, and 1/4 teaspoon of chili powder. Cook the beans for about 30 minutes to 1 hour longer. For jalapeno baked beans, add 2 tablespoons of minced jalapeno pepper and reduce the molasses to 1/4 cup. When the beans are tender, add 4 tablespoons of tomato paste and about 1/4 teaspoon of ground cayenne pepper. Add some onion powder for more onion flavor.